We have also added an Area of Circle calculator at the end of this page. 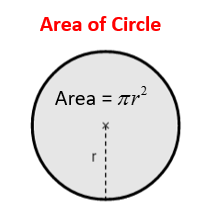 The following diagram gives the formula for the area of a circle. Scroll down the page for more examples and solutions on how to use the formula and also a proof or the formula. A circle is a closed curve formed by a set of points on a plane that are the same distance from its center. The area of a circle is the region enclosed by the circle. The area of a circle is equals to pi (π) multiplied by its radius squared. Since the formula is only given in terms of radius, remember to change from diameter to radius when necessary. The radius is equals to half the diameter. Find the area the circle with a diameter of 10 inches. Find the area the circle with a radius of 10 inches. Worksheet to calculate circumference and area of circle when given diameter or radius. How to use the formula A = πr2 to calculate the area of the circle given the radius? Find the area of a circle with radius 4cm. How to use the formula to calculate the area of the circle given the radius or the diameter? 1. Find the area of a circle with radius 3cm. 2. Find the area of a circle with diameter 20cm. The following videos show how to solve word problems using the area of circles. There are two circles such that the radius of the larger circle is three times the radius of the smaller circle. (a) How many times the circumference of the larger circle is the circumference of the smaller circle? (b) What is the ratio of the area of the larger circle to the area of the smaller circle? Example 1: Janell wants to replace the glass in her mirrors. She can buy glass for $0.89 per square inch. If the price includes tax, how much would she pay, to the nearest penny? Example 2: The rectangle has a length of 21 inches and each circle is congruent. What is the area of one circle? Example 3: A tire from Karen's car is shown below. What is the closest distance traveled, in feet, after 3 full rotations of the tire? From the formula A = πr2, we see that we can find the radius of a circle by dividing its area by π and then get the positive square-root. The diameter is then twice the radius. This video shows how to find the radius or diameter of a circle when given the area. Worksheet 1, Worksheet 2 on word problems that involve circles. To find the circumference of a circle when given the area, we first use the area to find the radius. Then, we use the radius to find the circumference of the circle. How to find the circumference of a circle given the area? The area of the circle is 12.56 cm2. What is the circle's circumference? How to calculate areas of circles and also composite shapes with circles or segments of circles? The shape is made from 4 semicircles of diameter 8m and a square of side 8m. The radius of each circle is therefore 4m, and you have the equivalent of 2 whole circles. Then add on the area of the square. The following diagram shows a visual proof for the formula of the area of a circle. Graphical proof of the formula of a circle. It involves dividing the circle into many sectors and rearranging the sectors to form a rectangle. The base of the rectangle is shown to be πr and the height of the rectangle is r. The area of the rectangle is then the product of πr and r. The area of the circle which is equal to area of the rectangle is then πr2. Enter the radius and this area of circle calculator will give you the area. Use it to check your answers.